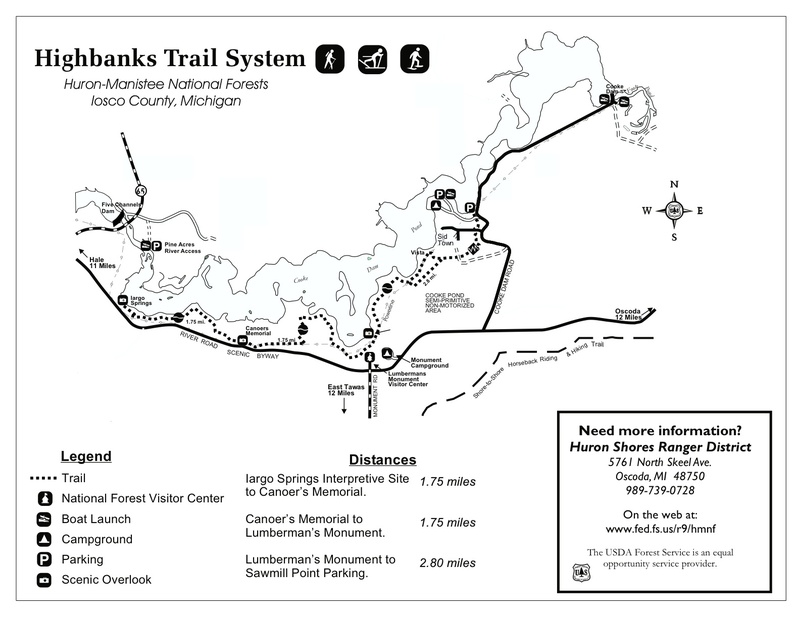 Enjoy spectacular vistas on this easy and relaxing hike along the rim of the towering 100 foot high bluffs that border the south side of the AuSable River. A wonderful hike through some of the finest hardwoods in Northeastern Michigan. Remote hike-in campsites and good trout fishing are a bonus. This is our favorite area for spectacular fall foliage. A favorite backpacking route through hilly terrain that features remote fishing lakes and abundant wildlife. A peaceful stroll along the enchanting lower AuSable River, Eagle Run features easy access and close proximity to Oscoda. This route also provides excellent fishing opportunities for steelhead and smallmouth bass. 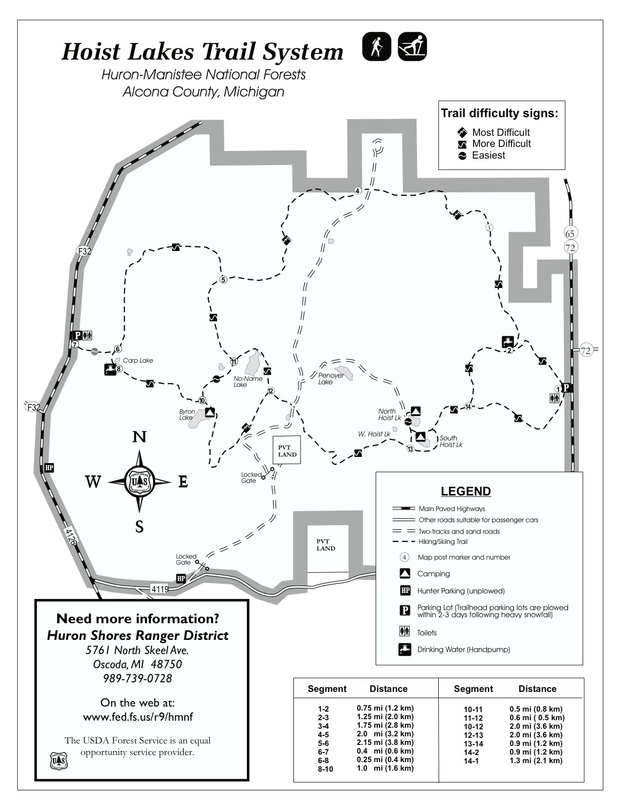 A large trail network comprised of three distinctly different trail systems, each with its own trailhead: Corsair (moderate terrain), Silver Valley (gentle rolling terrain), and Wright's Lake (steeper terrain). The assorted trails cross Silver Creek on rustic bridges and provide popular summer picnic and trout fishing opportunities. Rifle River Recreation Area is located within the AuSable State Forest, (west of Hale) and provides a variety of recreational opportunities. The site contains 4,449 acres with seven lakes, three ponds, seven miles of trout streams, and five small campgrounds. This area was formerly a private hunting and fishing retreat owned by the late H.M. Jewett, a pioneer auto manufacturer. In 1945 the tract, then called Grousehaven, was purchased by the (then) Department of Conservation from Mrs. Jewett. The Department of Conservation renamed it the Rifle River Area and used it as a field laboratory for fish and game research. In 1963, the Parks Division acquired the area and it is now known as the Rifle River Recreation Area. The headwaters of the Rifle River are found in the recreation area, and in these largely undeveloped conditions of the park, the river holds designation as a Natural River and is protected under the Natural Rivers Act. This recreation area contains an ecologically sensitive northern fen and an extensive high quality floodplain forest. 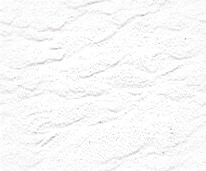 It provides suitable habitat to host a variety of rare species of plant and animal life. 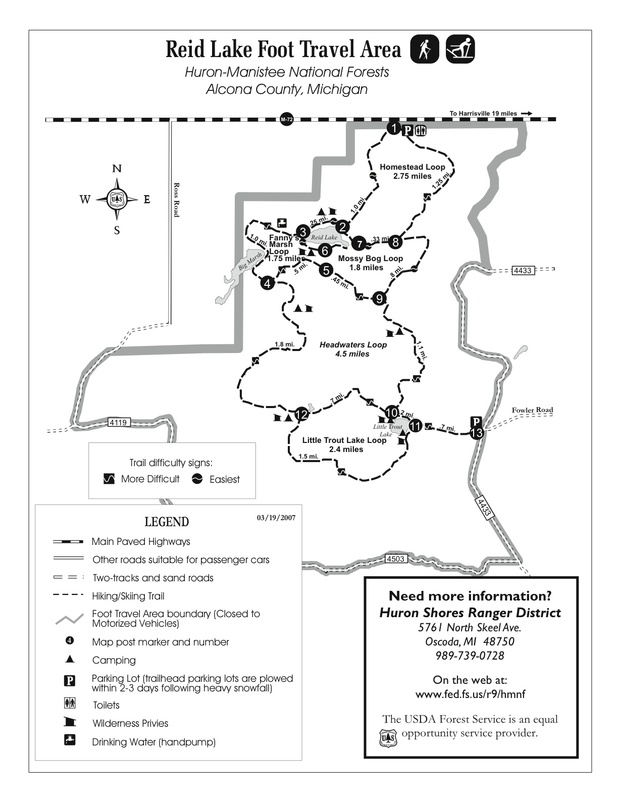 There are 14 miles of hiking trails in this area. 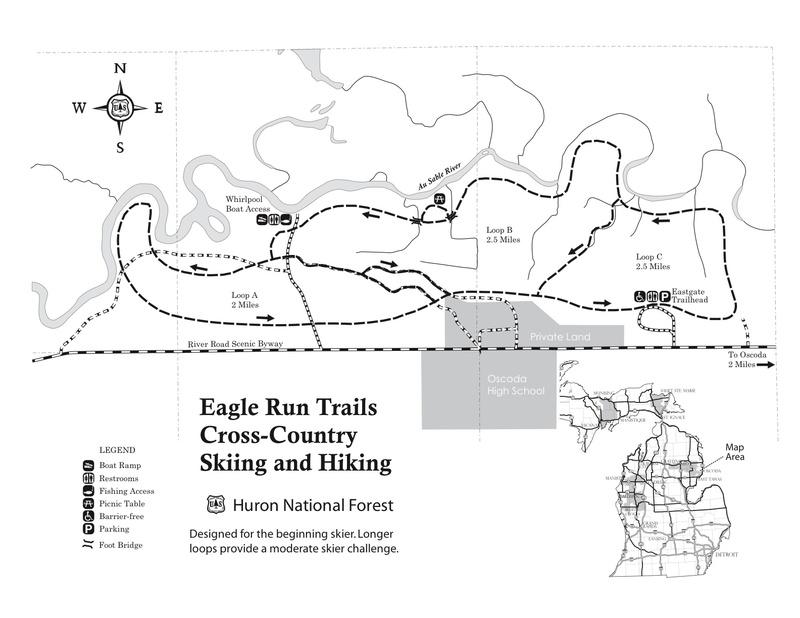 The trail is very scenic and encounters several streams, high vistas, and beautiful lakes. You'll find more strenuous steeper terrain near the front (North end) of the park, and gentle rolling trails to the south. Since the trails are mostly hard-pack soils, Rifle River Recreation Area is a favorite destination for mountain biking. Hikers and bikers respectfully share these trails. Mysterious, remote and undeveloped, Negwegon State Park is a hidden treasure with ten miles of hiking trails and one of the most beautiful secluded beaches on Lake Huron. The Negwegon-Thunder Bay area had great spiritual significance to the early Native Americans of the region. Please respect this land and leave the sites undisturbed. Note- drivers should be wary of the entry route to the park. The road is often so sandy that a four-wheel drive vehicle is needed. 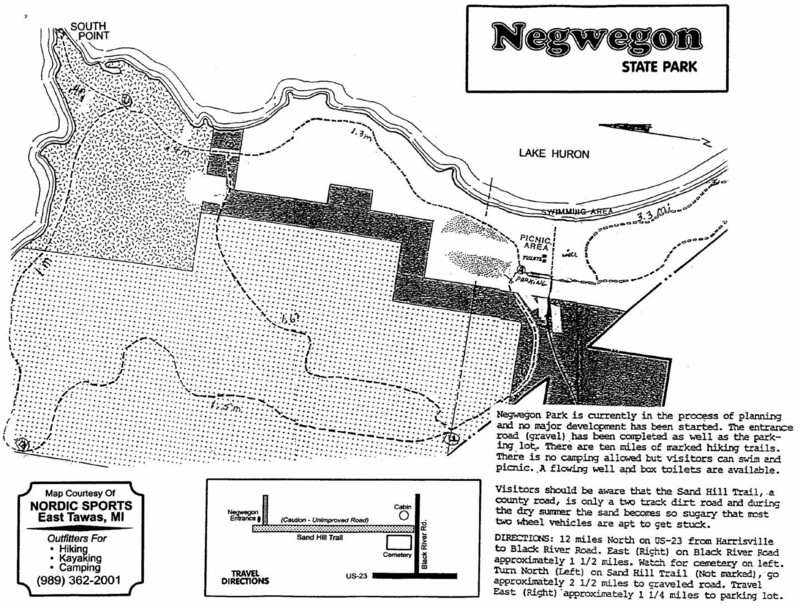 You will need specific directions and a map to locate Negwegon. Click on the miniature map (on right) to obtain this info. 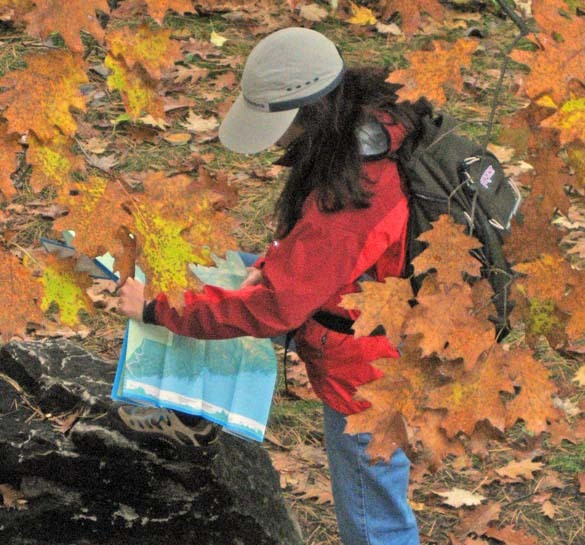 ARE THESE THE ONLY PLACES TO HIKE?